The success of Morrie Brickman's Small Society comic strip goes against a lot of my own ideas about what makes for a successful strip. The feature had no continuing characters (unless you consider the nameless schlubs to be that), and had no strong viewpoint or message about its subject of politics. I consider those two big strikes against it, which just goes to prove I am not ready to go into the fortunetelling business. Small Society was successful enough to spawn imitators, and today's obscurity, Capitol Gains, is undeniably a member of that fraternity. 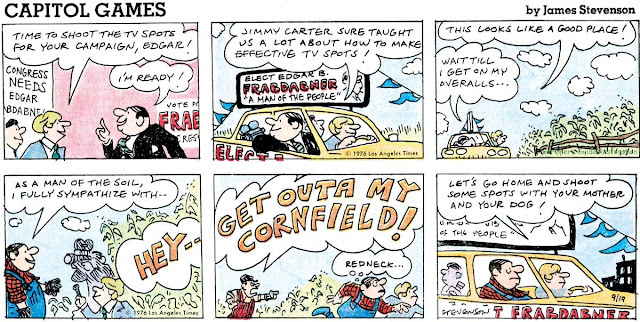 The strip debuted on February 23 1976 as a daily and Sunday, syndicated by the LA Times. The cartoonist on the feature, James Stevenson, seems an unlikely fellow for the job. He was a very successful children's book illustrator and author, whose dabbling in straight cartooning was at the high end of the ladder, primarily in the New Yorker. Why he was in the market to try out a 'me-too' syndicated comic strip in addition to all that is a mystery to me, but do it he did. 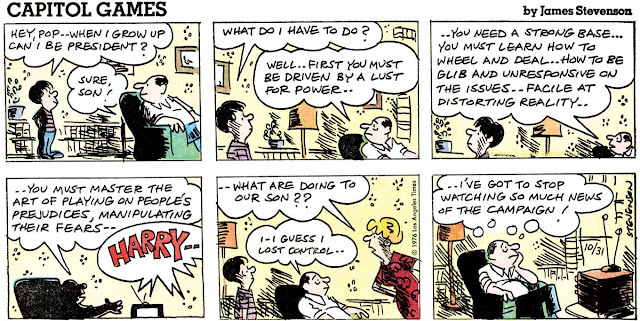 The strip is actually pretty good, certainly as funny or funnier than Small Society. It seems just a tad edgier than Brickman's feature, but still falters for trying hard not to offend readers of any particular political stripe. The strip did not catch on, and a title change to Capitol Games in June 1976 did nothing to change its fortunes. The strip seems to have been cancelled as of May 30 1977.